If you cook for yourself and another person you’re probably an expert at adjusting recipes to serve a smaller amount. 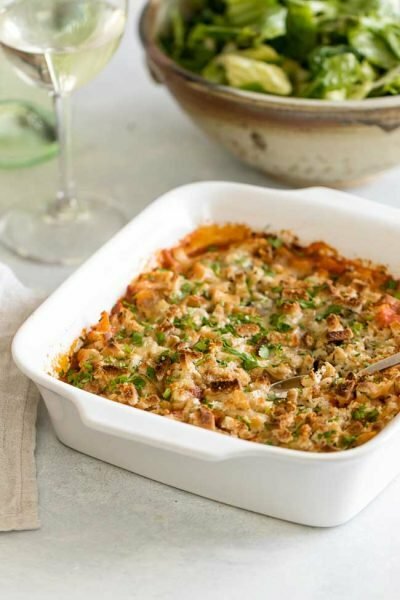 Unless you love days of leftovers, following conventional recipes that serve four or more leaves you with a pile of containers in your freezer that you know in your heart will be tossed out months later. I speak from experience. 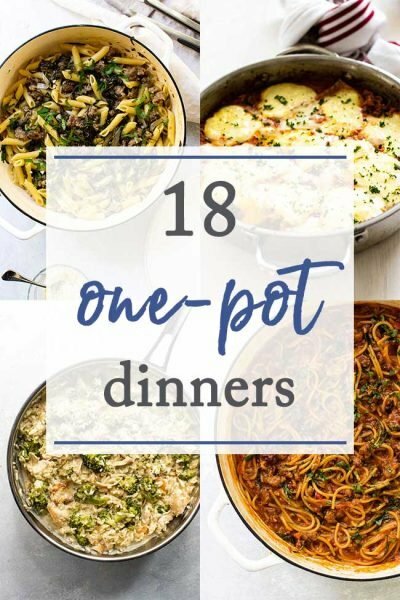 I understand your plight, so I’ve gathered up 11 easy dinner recipes for two. There are a few fancy ones and a few that are perfect for a weeknight. So, relax, you don’t need to figure out how to adjust any of these scaled-back recipes. So, take browse – I hope you find some inspiration! 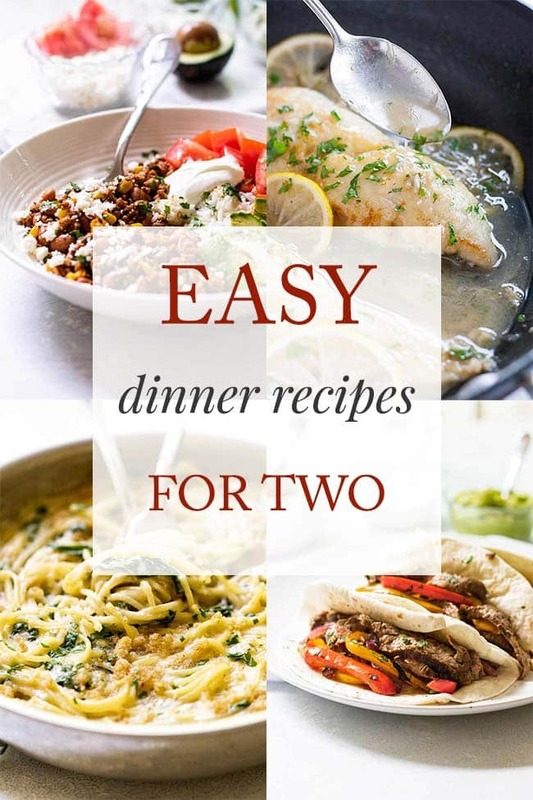 Click on the photos or recipe titles to get more details about these easy dinner recipes for two! 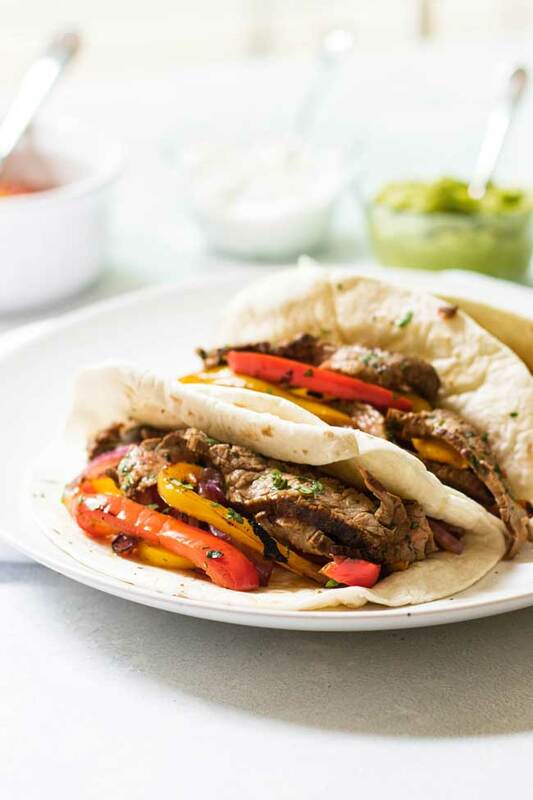 WEEKNIGHT BEEF FAJITAS – Girl Gone Gourmet | Sometimes beloved restaurant favorites are super easy to make at home and fajitas are a great example. The beef spends some time in a simple marinade before hitting a hot skillet. 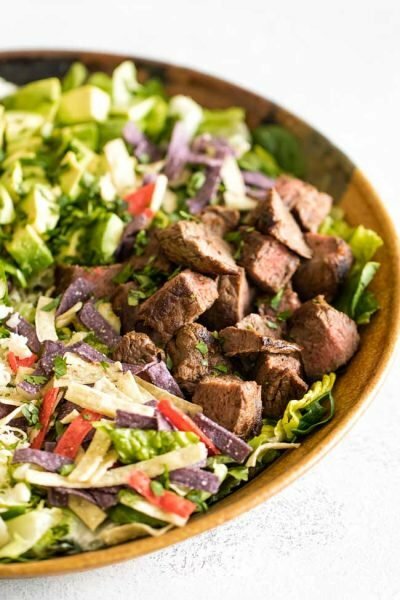 The bell peppers and onions cook in the flavor left behind by the beef and from there it’s ready to serve with all your favorite toppings like guacamole, sour cream, and salsa. Add a couple margaritas and you have a dinner for two that will rival your neighborhood Mexican cantina. 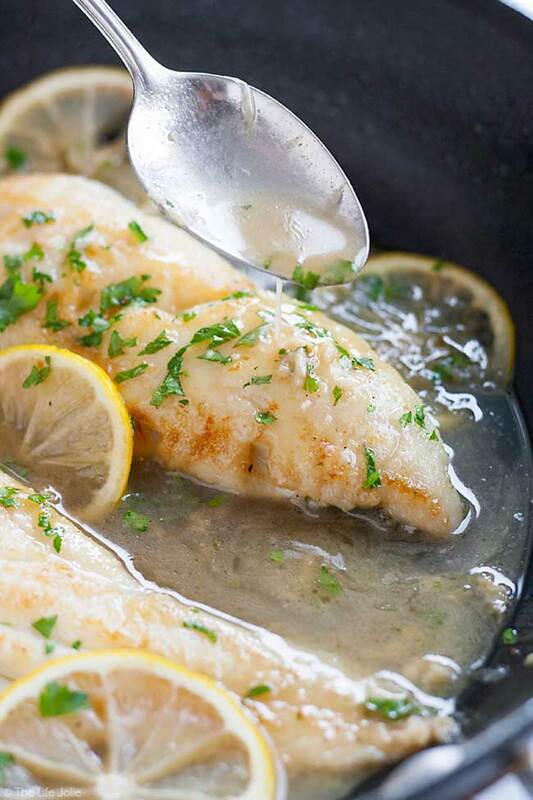 FISH FOR TWO WITH LEMON SHERRY PAN SAUCE – The Life Jolie | Fish is a great contender for fast dinners because it doesn’t need a long cooking time and a simple pan sauce is all it needs to dress it up a little. I love the flavors in this simple dinner for two and it all comes together in less than 30 minutes. CREAMY GRUYERE SPAGHETTI – Girl Gone Gourmet | Spaghetti is easy to turn to for a scaled-back dinner, but it’s easy to get stuck in a spaghetti and jarred tomato sauce rut. 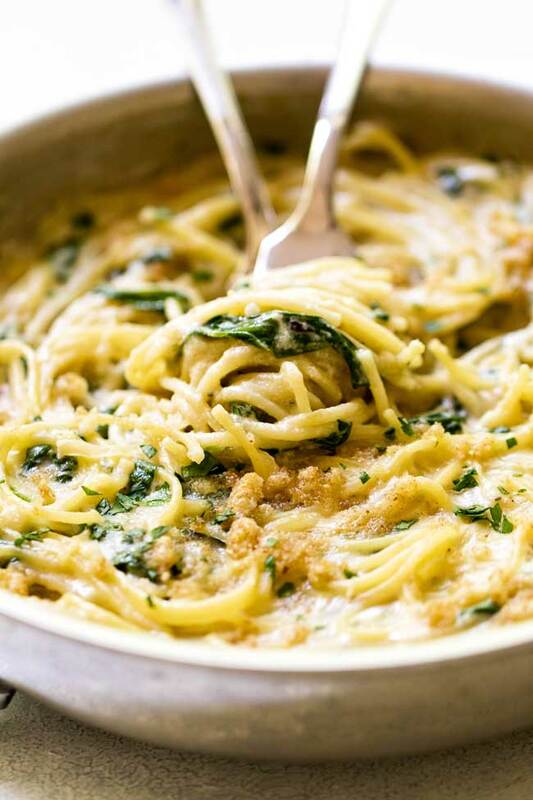 This spaghetti dinner shakes things up a bit with a creamy gruyere cheese sauce, some spinach, and a light bread crumb topping that adds a crispy texture. The sauce comes together while the pasta boils making this a fast 20-minute dinner. 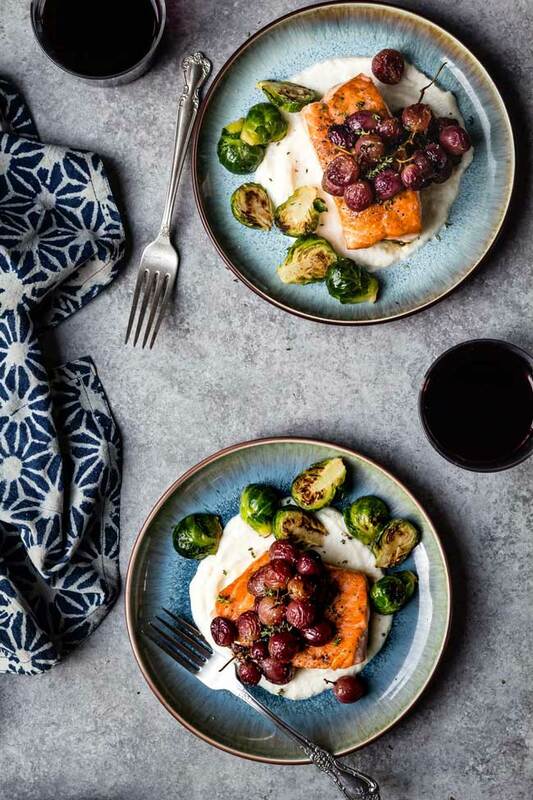 SALMON WITH ROASTED GRAPES AND THYME – Le Petit Eats | Would you believe this dish has only five simple ingredients (including salt!)? It looks like the perfect dinner when you want something fancy without having to spend hours in the kitchen. 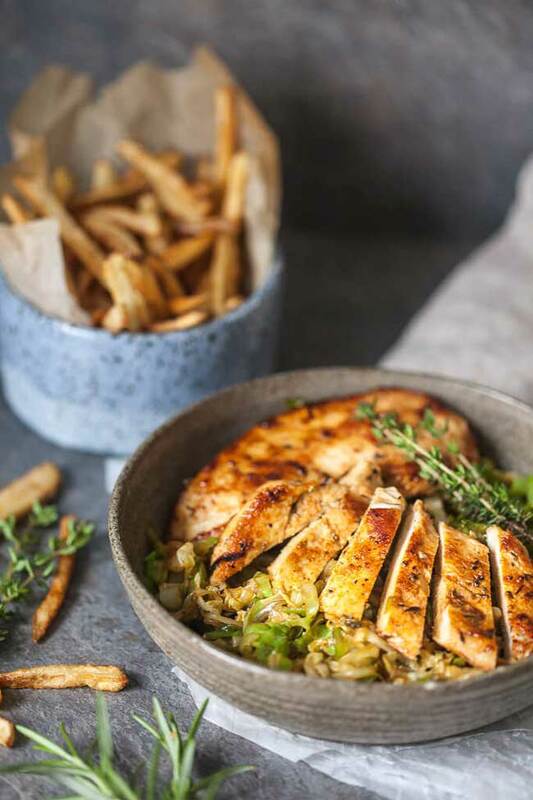 ROSEMARY GRILLED CHICKEN ON CABBAGE – Vibrant Plate | Another simple dinner for two that starts first with marinated chicken. The chicken cooks in a grill pan leaving behind all sorts of browned bits also known as flavor bits. Thin-sliced cabbage cooks on that same pan soaking up all that chicken flavor. It’s a low-carb dinner perfectly sized for two. LEMON BUTTER SHRIMP WITH PARMESAN TOAST – Girl Gone Gourmet | This one is best for a Saturday night after a long week. It’s so indulgent. 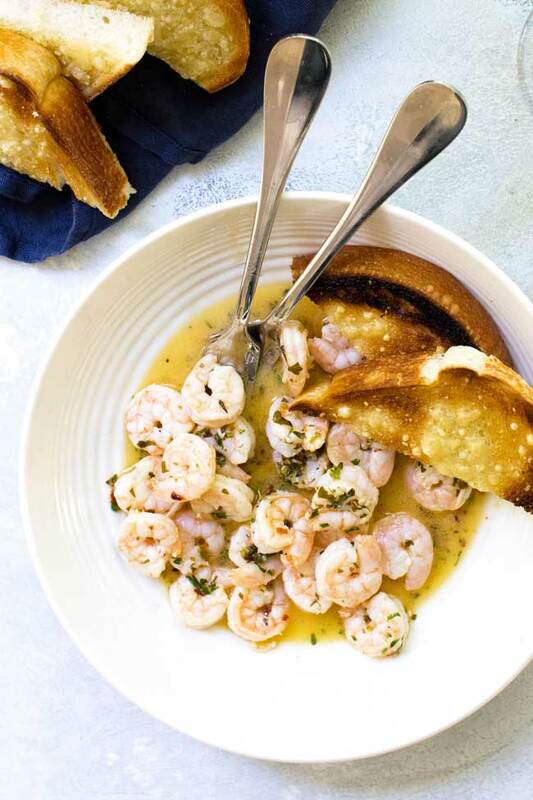 Shrimp sauteed in a lemon butter herb sauce and served with crusty toasted bread to soak up every last drop. Add a couple glasses of wine and it’s a wonderful way to unwind after a hectic week. 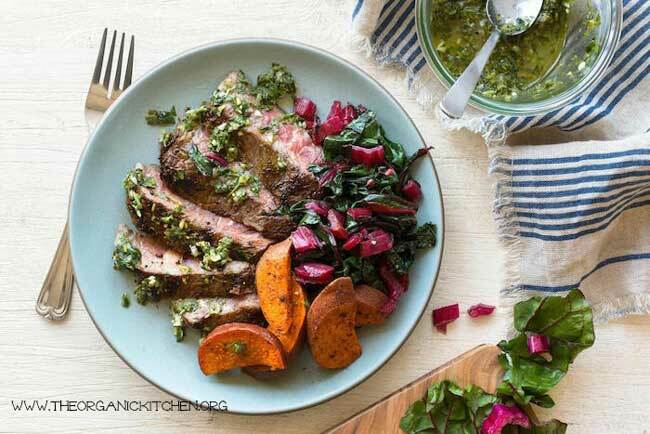 STEAKS WITH CHIMICHURRI AND ROASTED HARISSA SWEET POTATOES – The Organic Kitchen | And after you indulge on Saturday with butter shrimp and bread you can make this beautiful steak with chimichurri sauce and sweet potatoes to make up for it. So many delicious and good-for-you ingredients in this one. EASY GROUND TURKEY TACO BOWLS – Girl Gone Gourmet | Easy 30-minute ground turkey taco bowls for two with all the toppings! 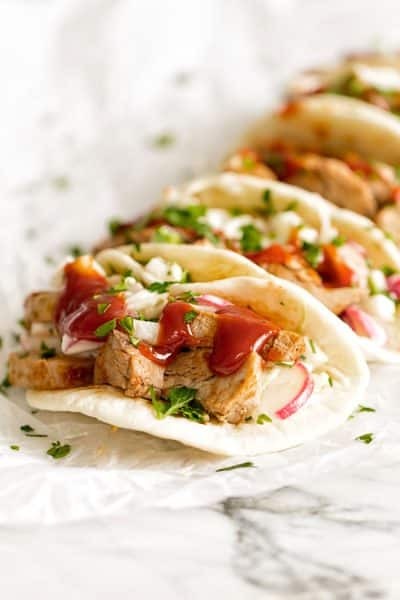 Because let’s face it, tacos are all about the toppings, right? 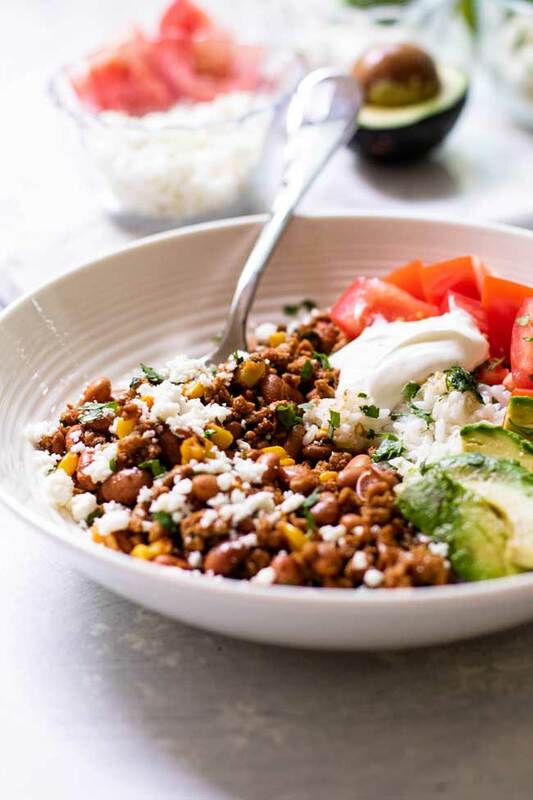 These quick bowls have ground turkey seasoned with spices, corn, and pinto beans spooned over a simple lime-infused rice. They’re topped with sliced avocado, diced tomatoes, queso fresco, and sour cream. 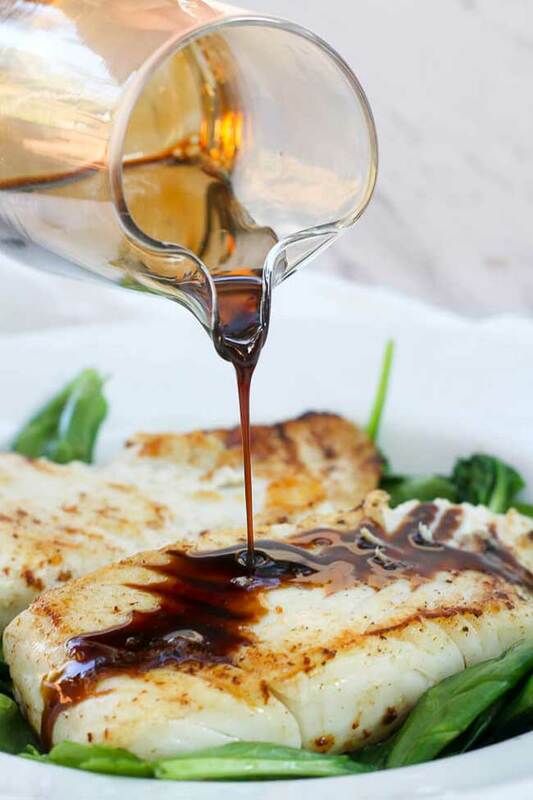 KENTUCKY BOURBON PAN SEARED HALIBUT – Champagne Tastes | Simple halibut topped with a rich bourbon sauce. This is the type of dinner you might order in a restaurant, but guess what?! You don’t have to because Sarah walks you through how to make this elegant dish for two at home. 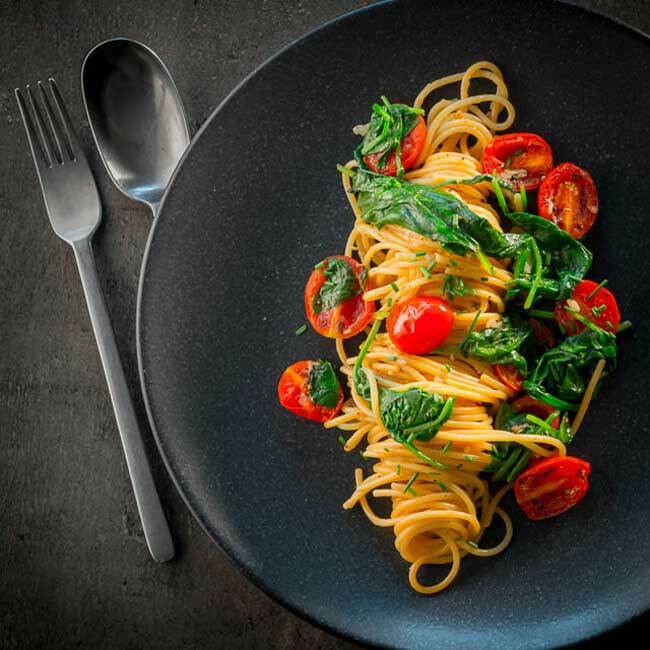 ROASTED GARLIC SPAGHETTI WITH TOMATOES AND SPINACH – Krumpli | Another elevated pasta dish this time with simple tomatoes and spinach and plenty roasted garlic. I love roasting garlic because it mellows its sharpness and I think Brian’s hit a home run with this simple dish that’s full of fresh flavor. 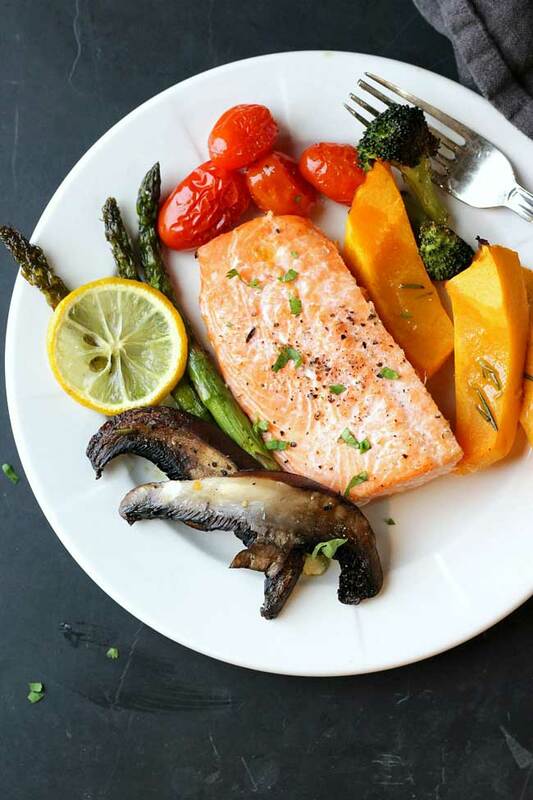 SHEET PAN DINNER FOR TWO: SALMON AND VEGGIES – Garden In The Kitchen | And to wrap our 11 easy dinner recipes for two, here’s a simple salmon dish, with a medley of fresh veggies, for two that’s cooked on a sheet pan which means clean-up is a breeze. Dinner for two without a big mess? Sounds good to me! My new cookbook is a collection of comfort food–inspired recipes scaled down to serve one or two people. It’s a book for anyone who wants to cook for themselves but doesn’t want leftovers cluttering up the refrigerator only to be tossed out later. 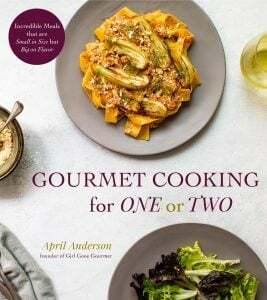 In this book, you’ll find 75 recipes for small-scale dishes including updated classics, 30-minute single-serving dinners, and simple one-pan recipes that you can make any night of the week! 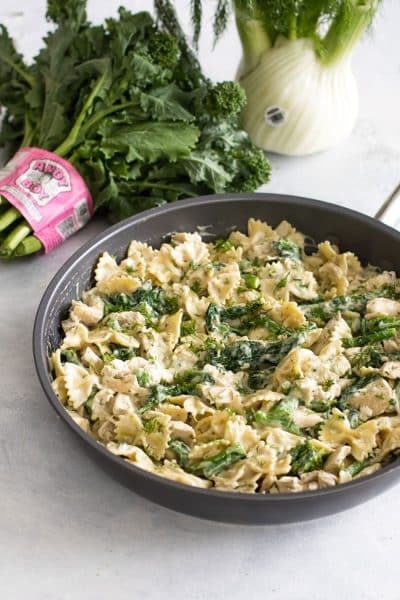 Thanks for including our recipe, what a great collection! Thank you for including my Steaks with Chimmichurri. Great post!